The Japanese have been using candlestick charts since the 17th century to analyze rice prices. 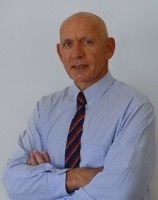 Candlestick patterns were introduced into modern technical analysis by Steve Nison in his book Japanese Candlestick Charting Techniques. 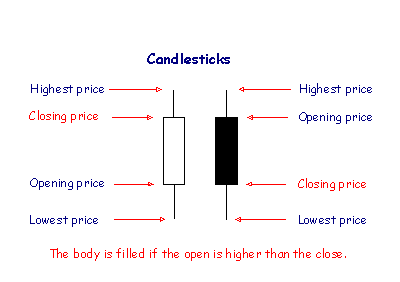 Candlesticks contain the same data as a normal bar chart but highlight the relationship between opening and closing prices. The narrow stick represents the range of prices traded during the period (high to low) while the broad mid-section represents the opening and closing prices for the period. If the close is higher than the open - the candlestick mid-section is hollow or shaded blue/green. If the open is higher than the close - the candlestick mid-section is filled in or shaded red. 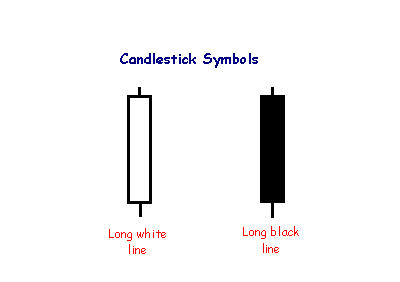 The advantage of candlestick charts is the ability to highlight trend weakness and reversal signals that may not be apparent on a normal bar chart. The shadow is the portion of the trading range outside of the body. 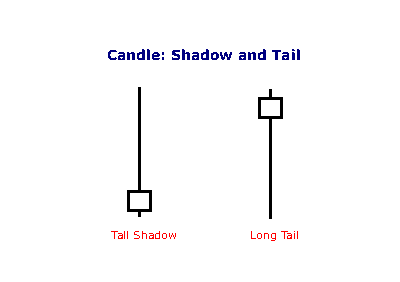 We often refer to a candlestick as having a tall shadow or a long tail. A long tail signals support. The same color as the previous day, if the open is equal to the close. The long white line is a sign that buyers are firmly in control - a bullish candlestick. A long black line shows that sellers are in control - definitely bearish. Marubozu are even stronger bull or bear signals than long lines as they show that buyers/sellers have remained in control from the open to the close -- there are no intra-day retracements. 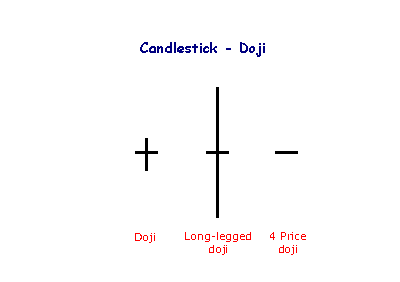 The doji candlestick occurs when the open and closing price are equal. An open and close in the middle of the candlestick signal indecision. Long-legged dojis, when they occur after small candlesticks, indicate a surge in volatility and warn of a potential trend change. 4 Price dojis, where the high and low are equal, are normally only seen on thinly traded stocks. 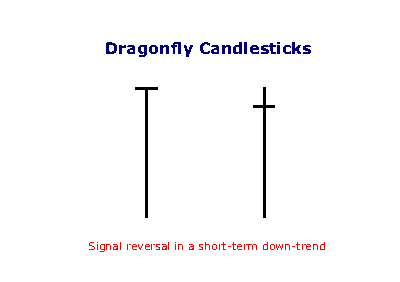 The dragonfly occurs when the open and close are near the top of the candlestick and signals reversal after a down-trend: control has shifted from sellers to buyers. The hammer is not as strong as the dragonfly candlestick, but also signals reversal after a down-trend: control has shifted from sellers to buyers. The shadow of the candlestick should be at least twice the height of the body. A gravestone is identified by open and close near the bottom of the trading range. 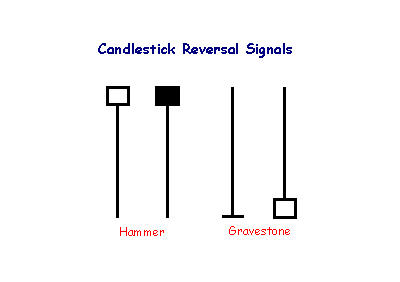 The candlestick is the converse of a hammer and signals reversal when it occurs after an up-trend. We now look at clusters of candlesticks. How one candlestick relates to another will often indicate whether a trend is likely to continue or reverse, or it can signal indecision, when the market has no clear direction. 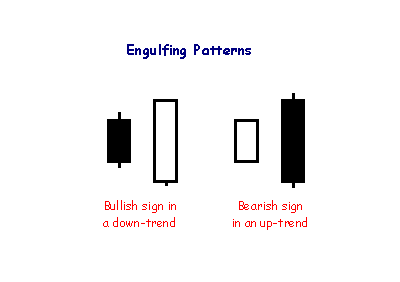 Engulfing patterns are the simplest reversal signals, where the body of the second candlestick 'engulfs' the first. They often follow or complete doji, hammer or gravestone patterns and signal reversal in the short-term trend. Harami formations, on the other hand, signal indecision. 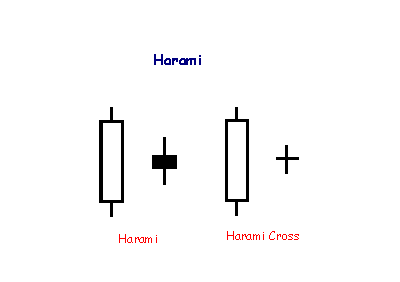 Harami candlesticks indicate loss of momentum and potential reversal after a strong trend. Harami means 'pregnant' which is quite descriptive. The second candlestick must be contained within the body of the first, though the shadows may protrude slightly. 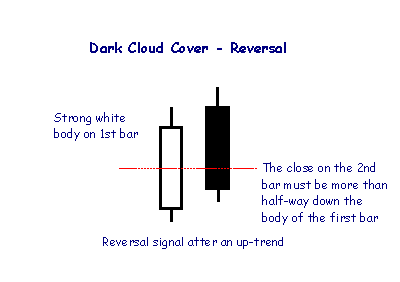 A Dark Cloud pattern encountered after an up-trend is a reversal signal, warning of "rainy days" ahead. The Piercing Line is the opposite of the Dark Cloud pattern and is a reversal signal if it appears after a down-trend. More controversial is the Hanging Man formation. 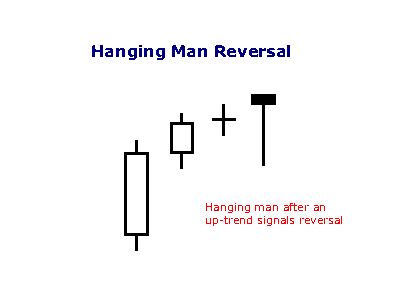 A Hammer candlestick is a bullish signal in a down-trend but is called a Hanging Man when it occurs in an up-trend and is traditionally considered a bearish (reversal) signal. Thomas Bulkowski (Encyclopedia of Chart Patterns) tested the pattern extensively and concludes on his website that the Hanging Man pattern resolves in bullish continuation (of the prevailing trend) 59% of the time. It is therefore advisable to treat the Hanging Man as a consolidation pattern, signaling indecision, and only take moves from subsequent breakouts, below the recent low or high. Star patterns highlight indecision. A long body followed by a much shorter candlestick with a short body indicates the market has lost direction. The bodies must not overlap, though their shadows may. Reversal is confirmed if a subsequent candle closes in the bottom half of the initial, long candlestick body. 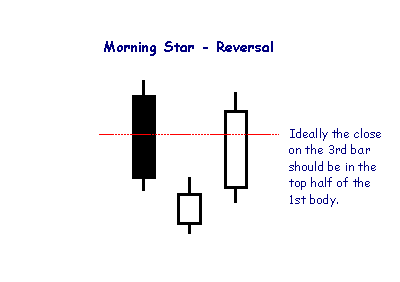 The Morning Star pattern signals a bullish reversal after a down-trend. The first candlestick has a long black body. The second candlestick gaps down from the first (the bodies display a gap, but the shadows may still overlap) and is more bullish if hollow. The next candlestick has a long white body which closes in the top half of the body of the first candlestick. 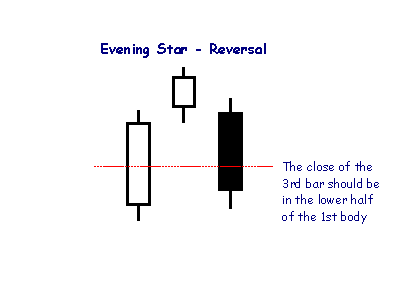 The Evening Star pattern is opposite to Morning Star and is a reversal signal at the end of an up-trend. The pattern is more bearish if the second candlestick is filled rather than hollow. 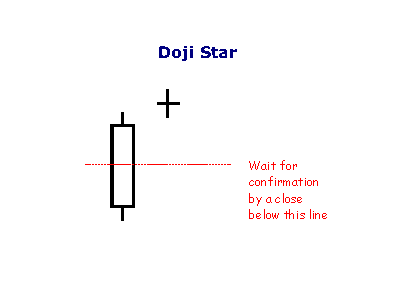 A Doji Star is weaker than the Morning or Evening Star: the doji represents indecision. The doji star requires confirmation from the next candlestick closing in the bottom half of the body of the first candlestick. 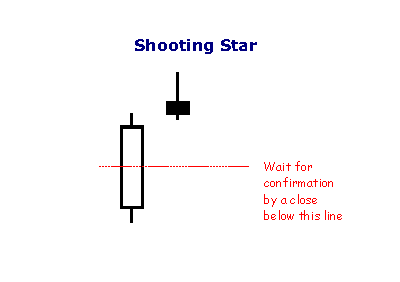 With a Shooting Star, the body on the second candlestick must be near the low — at the bottom end of the trading range — and the upper shadow must be taller. This is also a weaker reversal signal than the Morning or Evening Star. The pattern requires confirmation from the next candlestick closing below half-way on the body of the first. Many candlestick clusters will resolve as continuation signals after initially signaling indecision. But there are a few patterns that suggest coninuation right from the outset. 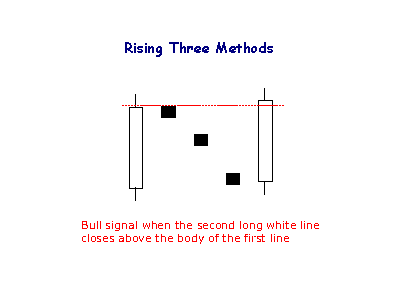 The Rising Method consists of two strong white lines bracketing 3 or 4 small declining black candlesticks. The final white line forms a new closing high. The pattern is definitely bullish. 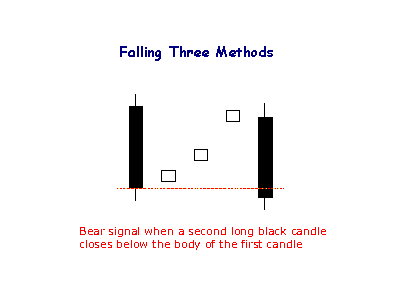 The bearish Falling Method consists of two long black lines bracketing 3 or 4 small ascending white candlesticks, the second black line forming a new closing low. While candlesticks may offer useful pointers as to short-term direction, trading on the strength of candlestick signals alone is not advisable. Jack Schwager in Technical Analysis conducted fairly extensive tests with candlesticks over a number of markets with disappointing results. Strongest Candlestick Patterns Japanese Candlestick Chart Patterns, displayed from strongest to weakest. Trading Candlesticks To improve Candlesticks accuracy, combine with Volatility, Volume, Support/Resistance and Trendlines. 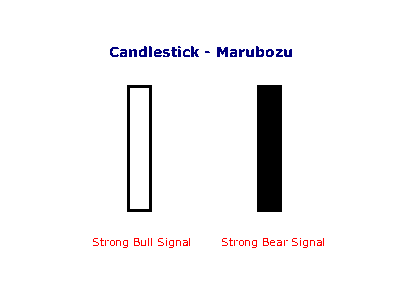 Candlestick Reversals Library of Japanese Candlestick Reversal Patterns, displayed from strongest to weakest, in two columns: Bullish & Bearish Patterns. 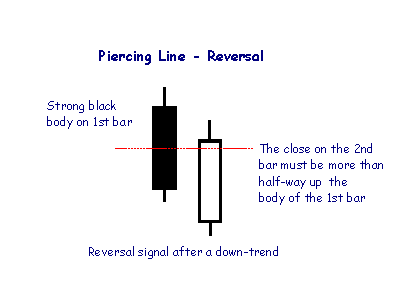 Reversals are candlestick patterns that tend to resolve in the opposite direction to the prevailing trend. Candlestick Continuations Library of Japanese Candlestick Continuation Patterns, displayed from strongest to weakest, in two columns: Bullish & Bearish Patterns. Continuation Patterns are candlestick patterns that tend to resolve in the same direction as the prevailing trend. Candlestick Consolidations Consolidation Patterns are typically weak candlestick patterns that have close to an even chance of resolving in either direction.